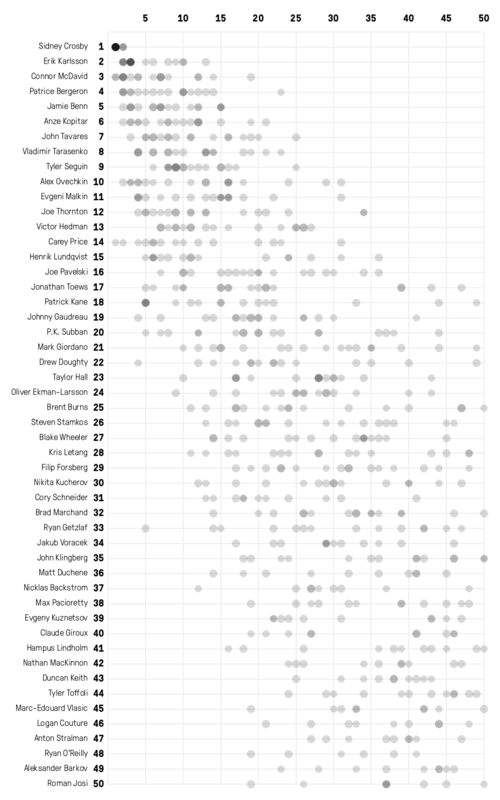 Welcome to the second annual Hockey Graphs Top 50 Players in the NHL list. The main reason I put this together last year (you can view that here) was as a basis for comparison against the other, more famous, top 50 players lists. The annual list is a season preview staple for TSN and THN and the rankings are usually slightly controversial. Both lists are created via a poll of various people inside hockey, who are generally very smart people, but who are also prone to old-school thinking with value sometimes being shaped by recency bias, reputation and a winning pedigree. This list is a bit of the opposite as it comes from mostly outsiders, people who study and analyze the game in the public sphere. That’s not to say these are necessarily smarter people, they just approach the game from a different angle based mostly on underlying trends and numbers over more traditional stats and what is immediately seen on the ice. The most interesting thing will be how much the list created by those outsiders differs from the one created by the insiders (TSN’s list). Is someone who’s higher on this list underrated or is he being overrated by the analytics community? Is someone who’s unranked here, but on TSN’s list worthy based on something missing in the numbers? That won’t be answered here, but it’s something worth thinking about. Now to the list. Last year we had 15 people submit lists, this year we’ve got 18 which is three (3) more chances to be wrong. @hockeyanalysis: Are we predicting the future or analyzing the past? @RyanStimson: Does aggressive play on the PK pay off? Here’s who they collectively believe are the NHL’s Top 50 players for 2016-17. What was interesting was that different groups of players bunched up into tiers and there were some clear drop-offs after certain players. I’ve illustrated that a bit with some line breaks on the list below. In the case of a tie, I went with the player appearing in a higher percentage of top 5’s, then top 10’s, then lists, and then highest rank on any individual list. 1. Sidney Crosby being the league’s best player is something almost everyone can agree on. He was unanimous on TSN’s list and was almost so here, finishing first on 15 of 18 lists. The best d-man was a bit more decisive as Erik Karlsson finished atop this list and Drew Doughty finished ahead on TSN’s. Karlsson was the top d-man on 16 of 18 lists here and second overall, while Doughty finishes fifth behind Karlsson, Hedman, Subban and Giordano. 2. The heir to Crosby’s throne is very apparent though as only one other player got more than a single first place vote: Connor McDavid. He was top five on half the lists, and top ten on all but four, both numbers are third to Crosby and Karlsson. After electrifying the world for half a season he takes a huge leap from 43rd last year to 3rd this season. 3. Victor Hedman got a lot of love here finishing as the second highest d-man and finished 11 spots higher than TSN’s list. He’s one of the guys here that the numbers crowd feels doesn’t get as much love as he should. Others on that list (10 spots or more higher than TSN’s list): Patrice Bergeron, Joe Thornton, Taylor Hall, Oliver Ekman-Larsson, Filip Forsberg, Cory Schneider. Players who made the cut that weren’t on TSN’s list at all: Mark Giordano, Jakub Voracek, John Klingberg, Max Pacioretty, Hampus Lindholm, Tyler Toffoli, Marc-Edouard Vlasic and Anton Stralman. 4. The flipside of that? Jonathan Toews, Patrick Kane, Drew Doughty, Steven Stamkos, Ryan Getzlaf, Nicklas Backstrom, Duncan Keith, Roman Josi were all ranked lower, while Corey Perry, Braden Holtby, Mark Scheifele, Shea Weber, Artemi Panarin, Alex Pietrangelo, Aaron Ekblad got votes but didn’t make the cut. Jonathan Quick got zero votes, as expected. 5. Goalies actually got much fewer votes in year in general. Only three goalies made the list at all, although five others did receive votes. 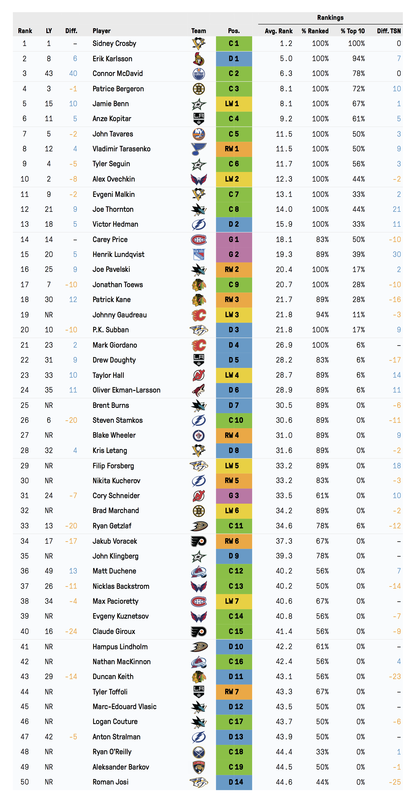 Two contributors had zero goalies on their list completely as a testament to their perceived value in relation to skaters, the spread in talent, and general uncertainty at the position. Centres dominated the list, while wingers and d-men were equally represented. 6. As for team representation, San Jose leads the way with five guys on the list while Tampa Bay was next with four. Pittsburgh, Dallas, Washington, Chicago, Nashville, and Los Angeles all had three a piece. Basically a list of the best teams in the league. Teams with no one on the list: Carolina, Columbus, Minnesota, Toronto, Vancouver. 7. There were 13 players who were on last year’s list who didn’t make this year’s list: Tuukka Rask, Corey Perry, Pavel Datsyuk, Phil Kessel, Rick Nash, Zach Parise, Jake Muzzin, Tyler Johnson, Jeff Carter, Ryan Johansen, Henrik Zetterberg, Shea Weber, Kevin Shattenkirk. 8. The 51st and 52nd players appeared on 56 percent of lists, meaning more than half the panel thought the duo belonged among the top 50, but they were undone by too many votes in the 40-to-50 range. Those players were Daniel Sedin and Dustin Byfuglien. Ryan O’Reilly finished 48th despite appearing on only one third of the lists. 9. The top five proved very difficult to decide. Just one player (Crosby) was on every single person’s top five and only one (Karlsson) was on more than half (McDavid was on exactly half). Karlsson finished second and his average ranking was exactly five, and only six players had an average rank below 10. In total, 19 different players were in someone’s top five and 25 were in someone’s top 10. The top of the NHL is just so close now that it’s unsurprising that the question “who are the NHL’s top five players” gets wildly different results. 10. There were 112 different players across the 18 lists. Opinions of who the league’s best players differ immensely, and while a composite list like this one is great, it’ll still likely be different from the one you’re thinking in your own head. The variance between how one person views a player versus another is crazy. I made a visualization of where each top 50 player got a vote (and that doesn’t account for the times they went unranked) to show just how much opinions differ. ← Just How Important is Quality of Competition? Very. Also, not much. It’s All Relative. Hi I was wondering how you made that graph! It is very cool. There are 16 new players on this list (listed as ‘NR’ from last seasons rankings) however you only list 13 players that dropped off last years the list. I think you are missing 3 players that were on last years list that are not on this years. One is Henrik Sedin. who the hell ranked kane at 49th…?